100% (red): All headways are at or below this value; in other words, this is the maximum size of a gap between vehicles for the hour and day in question. 85% (orange): Most headways lie below this value which can be thought of as the upper end of the wait most riders will see most of the time. 50% (green): This is the value at which half the headways are longer and the other half are shorter. It is the median within the data values. 25% (purple): One quarter of the headways lie below this value. If the 25%, 50% and 85% values are all similar, this indicates that the lion’s share of the service is running in a narrow band of headways, and that brings reliability from a rider’s point of view. If the 25% values hug the axis with values of only a few minutes while the median sits well above this, then the service is running in bunches (short headways followed by longer gaps). These situations will also be reflected in an 85% value that is well above the median (the gaps offsetting the bunches). Note that in the first section below, only 504 King cars are included. This is intended to show what the service looks like by the time it arrives “downtown” as a comparison to later charts that will show what it looks like beyond the pilot and the overlay of the 514 Cherry service. These areas and services will appear in later sets of charts. The values during the AM peak bounce around a bit over the past year, and there are a few periods where the maximum headway drops down compared to most months. One of these periods is in late November 2017, just after the pilot began, and another is in March 2018. However, there is no reduction in the 85% values which have stayed fairly constant throughout. This is no particular surprise as the AM peak was not a problem before the pilot and there was little reason to expect much change. 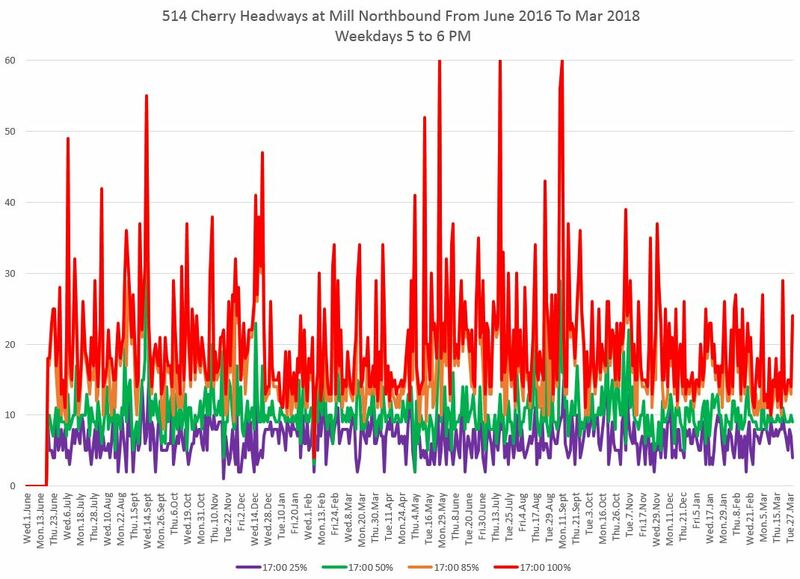 During the midday period, there is a slight change from the onset of the pilot in that the peaks are generally lower, and there is a drop in the median headway starting in mid-December. How much of this is due to the pilot itself is hard to tell pending the addition of warmer-weather data. The afternoon peak also shows a marked improvement in regularity with lower maxima from the onset of the pilot to mid-December, but then things return to more or less the pre-pilot conditions. It was those early results that raised hopes for the pilot bringing more reliable service, but the effect has not been sustained. Possibly there was a change in mid-December in line management. In other words, the benefit could have less to do with the pilot itself, than with the extra attention the route received during its early weeks. Early evening service shows a wide gap between median and 85th percentile values, with a 25th percentile hugging the 1-2 minute range. 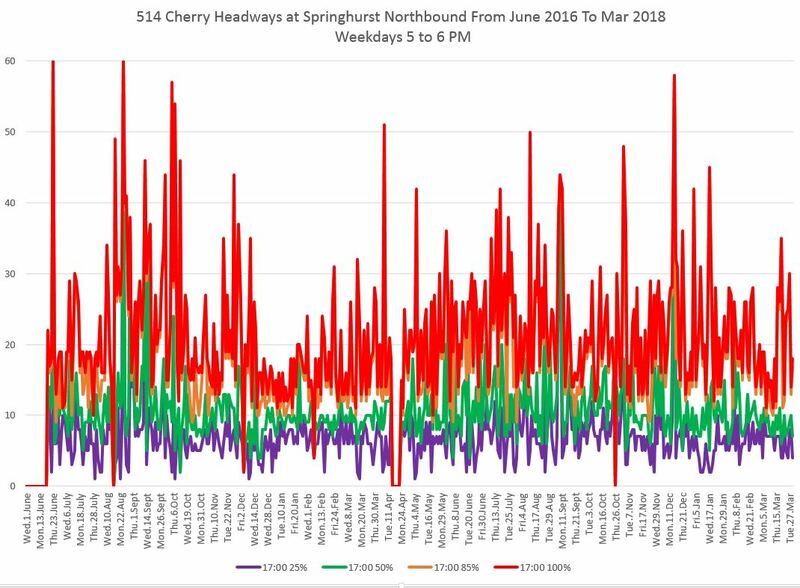 This shows service that is routinely bunched, and the maxima are even worse sitting in the 10-20 minute range than the 85th percentile values. Late evenings continue this pattern with a mixture of shorter headways (25th percentile in the 3-5 minute range) and long (85th percentile regularly above 10 minutes). Maxima above 20 minutes are not uncommon. The eastbound charts are similar to the westbound with some improvement after the pilot begins, but the results are very uneven and it is hard to point to a change that is due to the pilot itself. Late night service shows the effect of a schedule change in mid-February when all streetcar operations shifted from Roncesvalles carhouse to Leslie and Russell in the east end. The more-frequent early evening scheduled service now extends beyond 10 pm eastbound at Yonge although this is commonly a through car immediately followed by one that is headed for a carhouse. 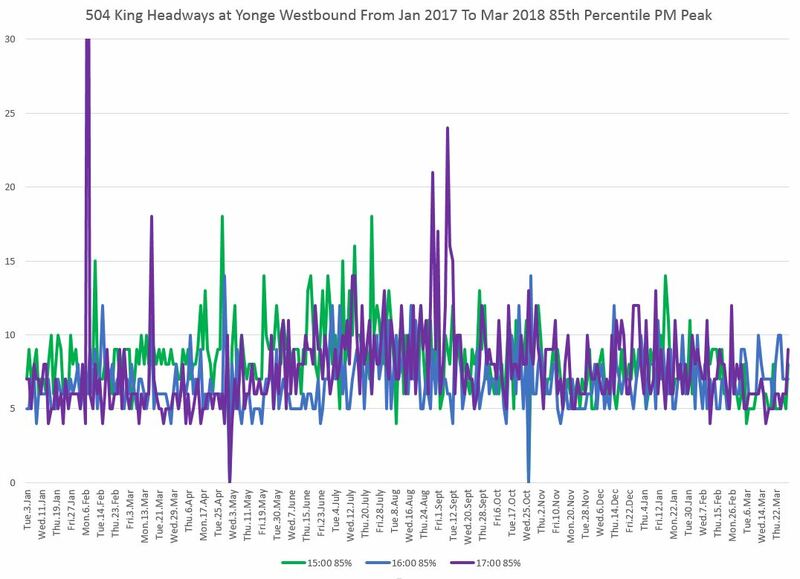 Another way of looking at the data is to track the behaviour of only the 85th percentile, in effect, a value that reflects what most riders see while clipping off the spikes caused by major delays. For the AM peak, the range of values for each hour from 6-10 am stays generally in the same range. The PM peak data shows the same drop in mid-November that was associated with the onset of the pilot, and another improvement in March, but there are comparable data in early 2017 and so this cannot be credited to the pilot project. The real trial will come through the warmer months when 2017 data showed an increase in the 85th percentile values. Eastbound data show similar patterns. The charts above are in pdf format below. 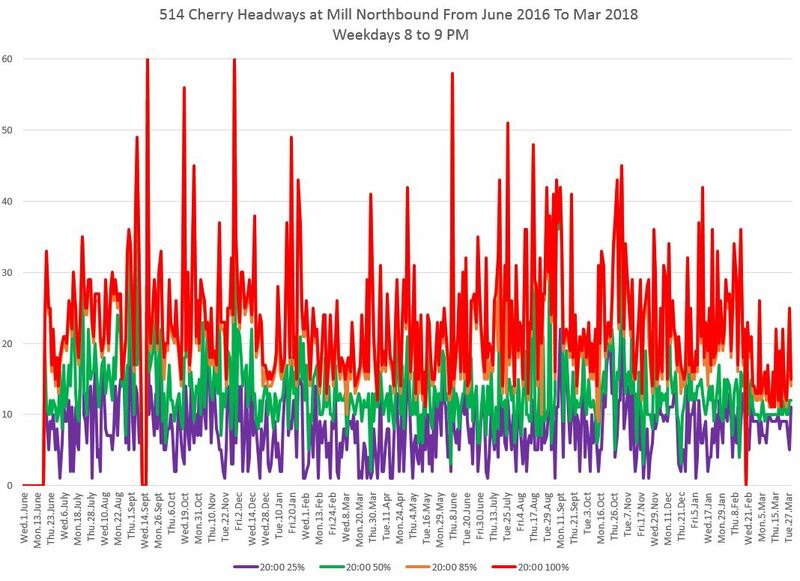 The charts above do not include 514 Cherry cars. To get a sense of their contribution to service in the core, I created a consolidation of data for the King car alone and for the combination of King plus Cherry. The chart below covers only the first three months of 2018 whereas those in the previous section also included all of 2017. This gives the data a bit more “elbow room” so that one can easily see what is happening. The solid lines are the 504 King data, the same as are charted in the previous section, but over a longer interval. The dotted lines show the effect of the additional 514 Cherry service which pulls down the 85th percentile, and also makes some dents in the 100th percentile peaks. 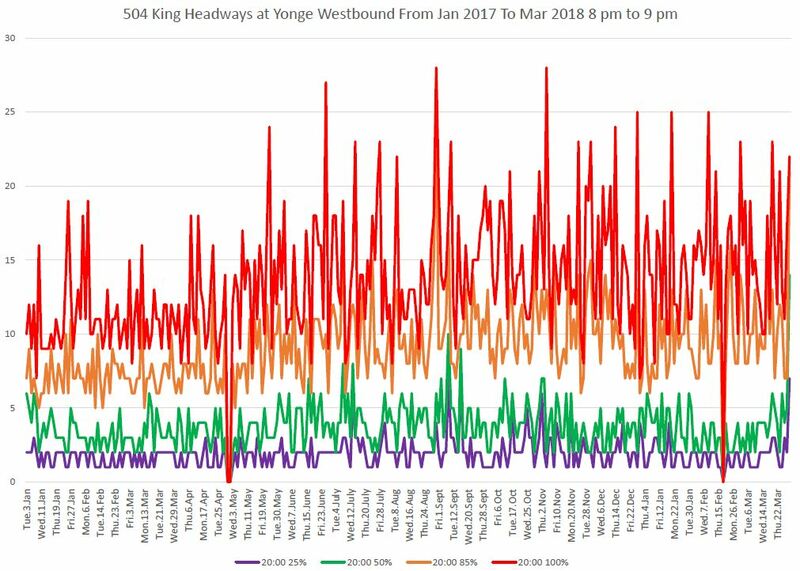 The result is that riders whose destination lies between Yonge and Dufferin see quite frequent service through the peak 5-6 pm hour. The pattern is similar through the day, although less so in the late evening when 514 Cherry service is infrequent. The full chart sets are linked below. The result of the combined services is that even though headways are less than reliable on each route individually, they combine to provide a tolerably frequent service in the central portion of the route. 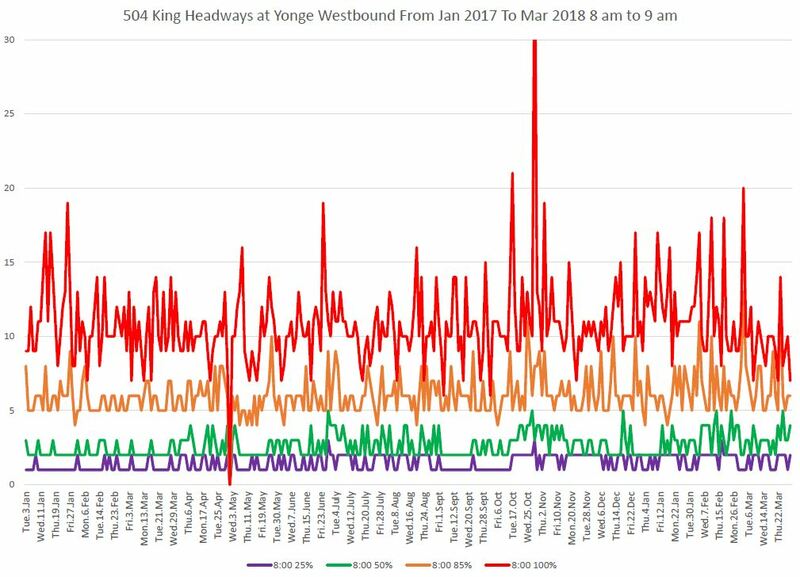 Things may seem all right downtown, but the situation on the outer areas is less attractive, and puts the lie to the TTC’s claims about service spacing from terminals. 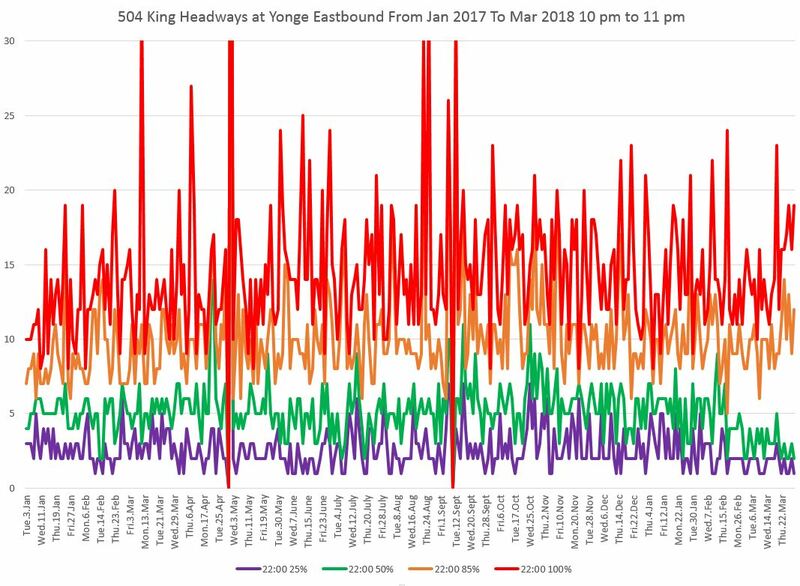 Headways from Dundas West Station inbound are erratic and show little effect from the pilot beyond the already-noted seeming improvement just after implementation. The range of values widens as the day goes on and is particularly bad in the late evening. The 85th percentile routinely lies above the 10 minute line with the 100th percentile regularly well above 20 minutes. This shows not just the erratic service on the central part of the route, but also the effects of short turns at Roncesvalles & Queen. The midday chart is shown here, and the full set linked below. A bit further in on the route, at Jameson, the service includes cars that were short turned, and the headway percentiles are lower than at Dundas West Station. Even so, high maximum headways are still common particularly in the evening. The situation from Broadview Station inbound is similar to that at Dundas West. East end service suffers from short turns at Parliament and, to a lesser extent, at Church. 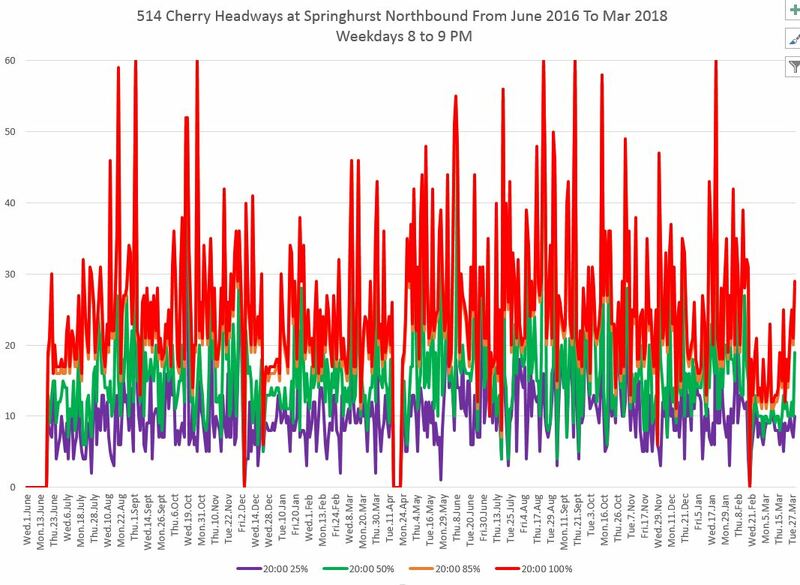 The 514 Cherry service began in mid-June 2016, and service at the terminals has been erratic since opening day. 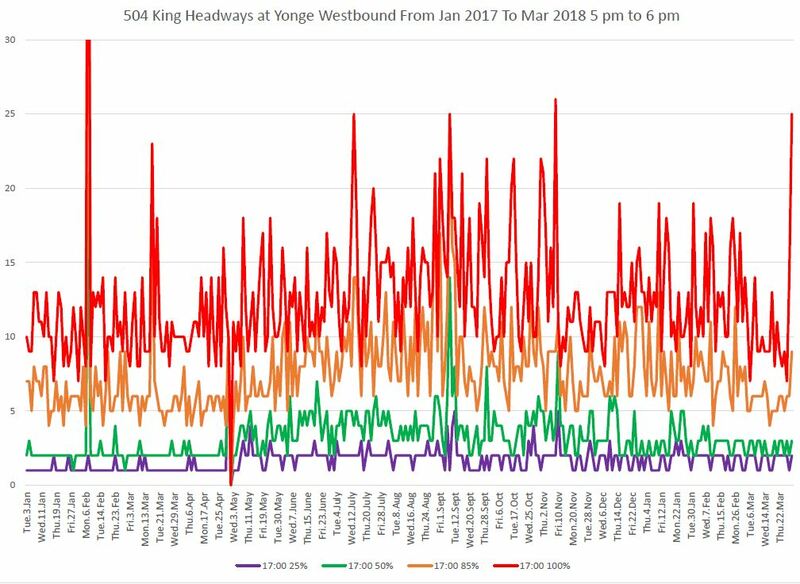 The King Street pilot produce some improvement in the short term in November-December 2017 (as it also did for 504 King), but the headway reliability declined after the first month. 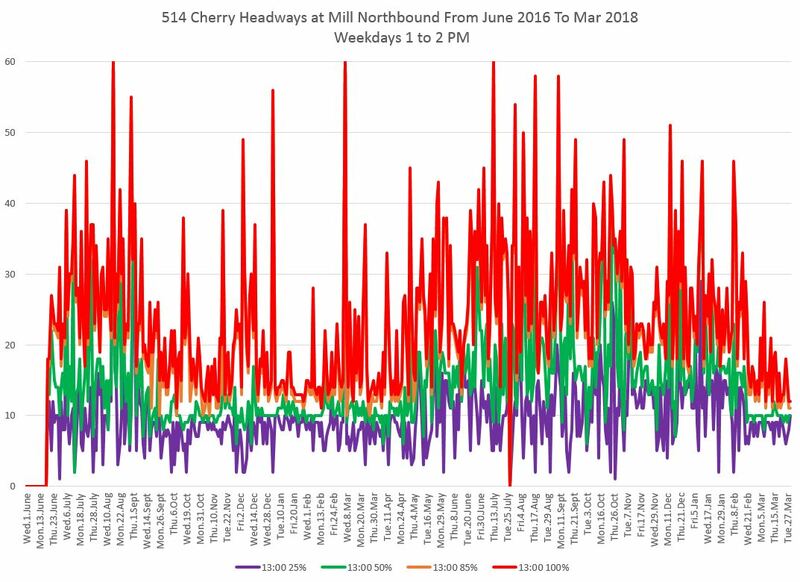 Schedule changes in mid-February 2018 have substantially improved service quality at the terminals during many time periods. One must ask why it took the TTC so long to address service quality on this route with appallingly wide headways a common situation during almost all operating periods. This shows how service on the tail ends of the route south of King really didn’t matter, but raises the larger question of why a route touted as serving a new neighbourhood and a tourist destination was treated as an afterthought, as extras for the King street line. 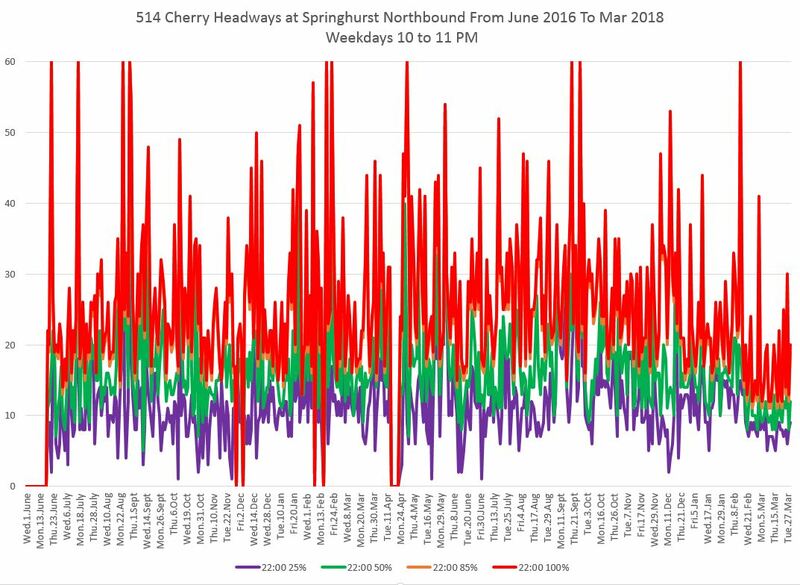 Note that the charts for 514 Cherry have a different maximum Y-value of 60 minutes compared to 30 minutes used for 504 King. This was necessary to display the very common high values found in the Cherry route’s headway data. Service from Distillery Loop starts out well enough in the AM peak although gaps of twenty or more are distressingly common in a peak period service. For a period at the beginning of 2017, service was much better-behaved than usual. A schedule change in May 2017, intended to provide greater running time at the expense of wider headways, did not tame the erratic nature of service which, if anything was worse after than before. 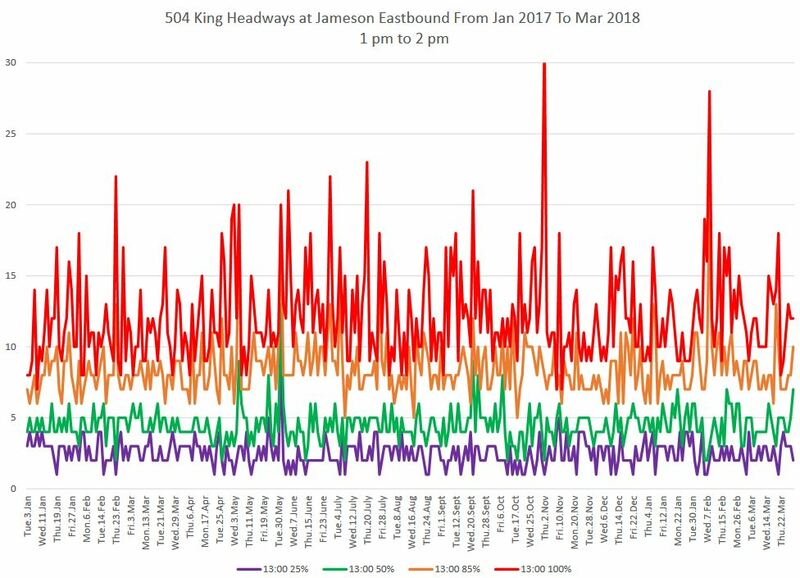 The benefit of the King Street Pilot is evident from mid-November, but it ends abruptly in mid-December. There is no explanation for this other than possibly the removal of added line supervision that had been laid on for the pilot. 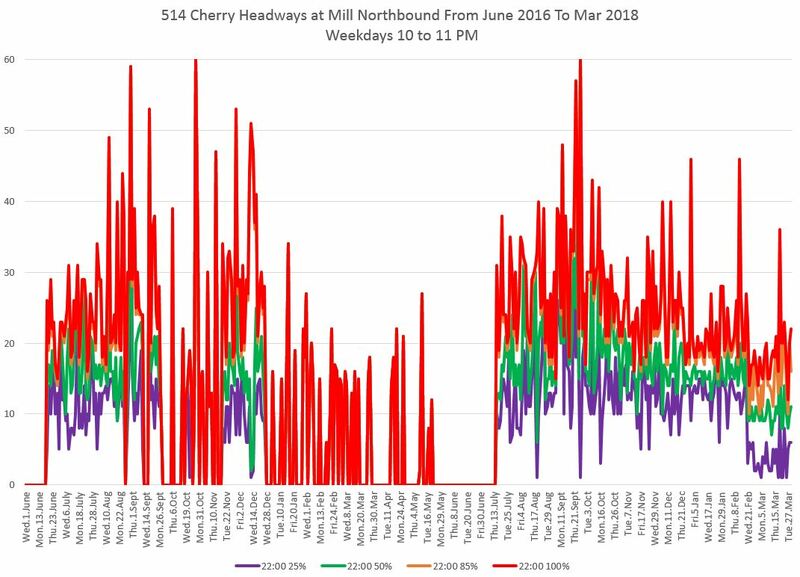 The schedule change in February 2018 brought both lower scheduled headways and a much more reliable service. The PM peak shows many of the same patterns as the midday service except that the schedule change in February 2018 was not as substantial during this period of the day. The early evening shows some improvement similar to the midday service. 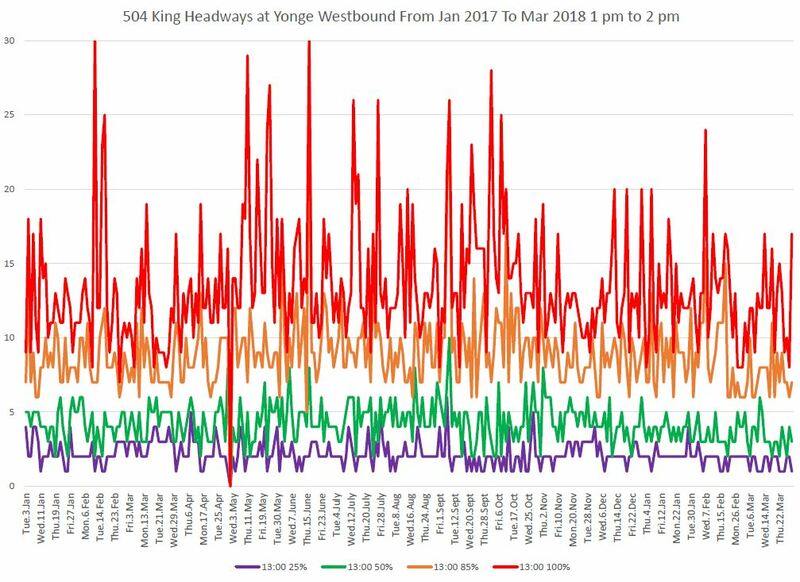 The embargo on service south from King during 2017 shows up as a wide notch in the chart. For a time, one car might venture down to Distillery Loop just after 10 pm, and this shows up as a 100% value for the headway. Service, such as it was, by the WheelTrans shuttle bus does not show up here because these vehicles were not tracked as part of the 514 service. With the schedule change in February 2018, some cars after 10 pm run in to Leslie Barns from Distillery Loop. Typically these leave the loop close behind a car headed downtown, and this shows up as a very short 25th percentile of the infrequent service during this hour. Weekends have different patterns because there are no “peak” periods but they do share with weekdays a well behaved service early in the day followed by more erratic service in the afternoons and evenings. The situation at Dufferin Loop eastbound is somewhat different in that very wide headways are more common here because the erratic nature of service is compounded by short turns before cars even reach Liberty Village. There is a noticeable improvement with the new schedules in February 2018. 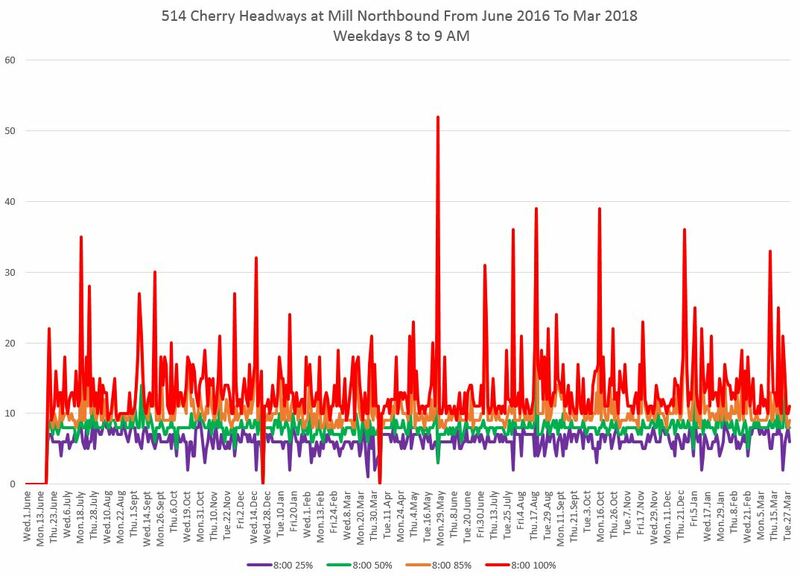 As at the east end of the route, the AM peak is relatively well-behaved, although with many days showing maximum headways of 20 minutes or more. There is a quite noticeable improvement since the schedule change in February 2018. 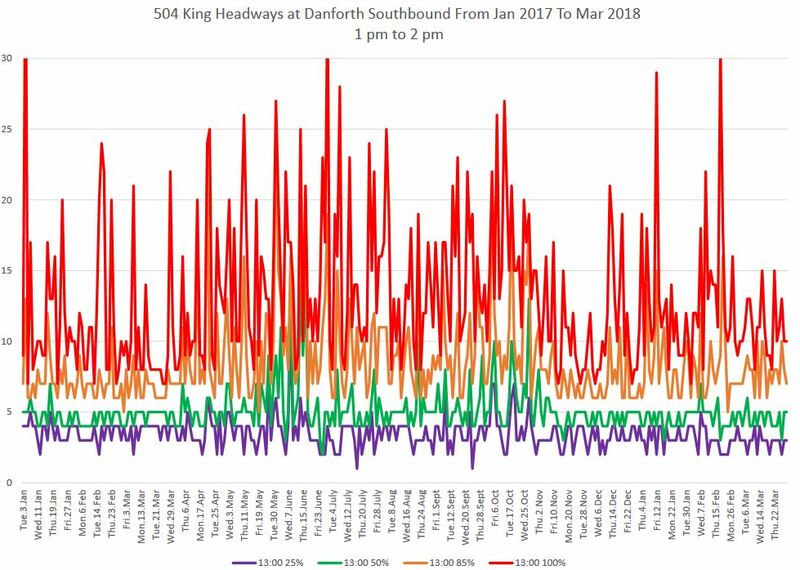 Midday shows a pattern we saw in the east end as well with a marked decline in service quality following schedule changes in May 2017, a brief improvement with the King Street Pilot in November 2017, and finally a return to more reasonable headways with the February 2018 schedules. 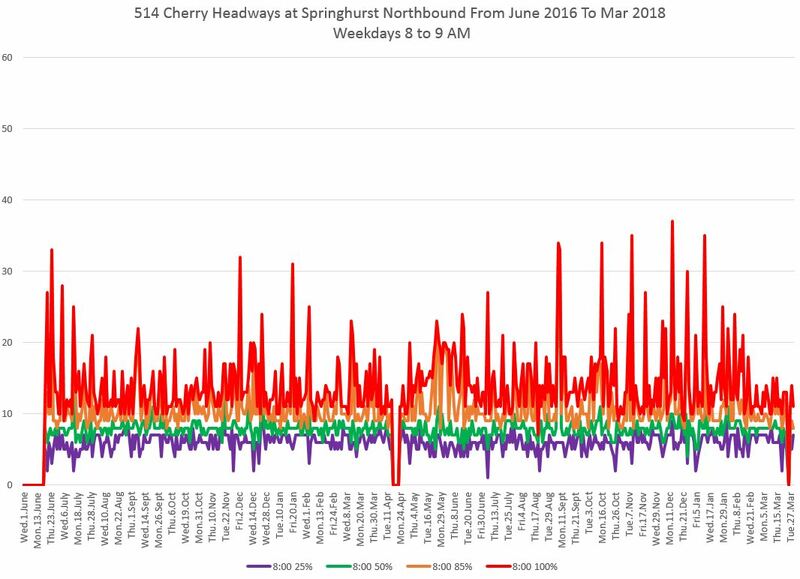 Although the orange 85% line only peeks out from behind the red 100% line, note that it was routinely above the 20 minute mark from May 2017 to February 2018. PM peak service shows many of the same patterns as earlier periods and again with very common values above the 20 minute line. Early and late evenings show the improvement due to new schedules in February 2018. September 4, 2016: A mix of CLRVs and LFLRVs is scheduled, but headways and running times are unchanged. May 7, 2017: Service scheduled for LFLRVs. Weekday midday headway widened from 10′ to 15′ and round trip time reduced by the removal of recovery time. Headways and running times unchanged during other periods. February 18, 2017: Weekday midday and early evening service improved by restoration of the pre-May 2017 CLRV headway and recovery time. Sunday afternoon service improved. This entry was posted in Cherry Car, King Car. Bookmark the permalink. Steve: It’s a tad more complicated than this. There’s an absurdity clearly manifest in what Steve Munro documents that approaches Chaos Theory. Any system that needs constant flow will become erratic and prone to blockage unless factors are present to prevent that. If the City and TTC wish to see the third largest carrier route of passengers improve, let alone succeed, even as a pilot, they’re going to have to commit a heck of a lot more than $1.5M to it. 228 (1) The Lieutenant Governor in Council may by regulation authorize or establish a project for research into or the testing or evaluation of any matter governed by this Act or relevant to highway traffic. 2005, c. 26, Sched. A, s. 33 (1). As to why Queen’s Park was never petitioned to assist in this boggles the mind. The (effectively, Transport Minister) has incredible powers under the HTA, for ten years under this section of the Act, to set up the Pilot in a way that would assist greatly in enforcement and ease of passing through intersections. And where was the request for Federal Infrastructure grants for a signal/control system, *Pilot or Not* for King Street and streetcars? Steve: If DoFo become premier, you can kiss any assistance for his much-hated streetcars goodbye. I absolutely do not have the patience to read every detail in this exhaustive (exhausting?) study you have put together. Your comments analyzing all this leads me to the conclusion that it is “same-old same-old” when it comes to TTC route management. I am of the opinion the TTC could not co-ordinate a two-holer outhouse! Steve: That’s ok. I don’t expect most people to read every word of these articles, but the detail is there for those who want it and especially for those in official positions. 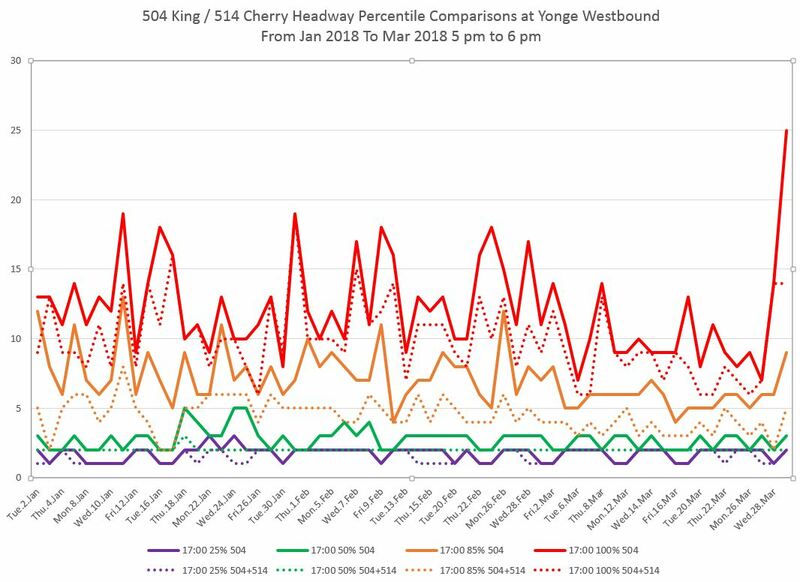 Specifically on the King Pilot, I want it to succeed, but I want any claims made for it to be rooted in actual data, and where there are issues beyond the transit reservation itself, these need to be examined too. I know you have said this many times and it is apparent from your many analyses, but has the TTC actually said as much as well, and did they characterize it that way? “If only the service would depart on time!” makes it sound like, oh well, we’d like to run regular service in the middle of the route, but the service isn’t departing on time from the endpoints, so whaddya gonna do? Isn’t that the one thing that they actually do have some degree of control over? They can’t control where a streetcar gets stuck behind a left-turning vehicle in the middle of the route, or where the curb lane is blocked in rush hour by a courier truck, or when an influx of traffic materializes on King or Queen West because of a crash on the Gardiner, or where a streetcar takes longer for boarding because a large group of passengers arrives at once. But they can control cases where two streetcars leave Neville loop one behind the other. Streetcar lines, and many bus routes, have close scheduled headways. Two cars can leave the loop together and be within the six minute acceptable window. Suppose that the scheduled times are at 12:00 and 12:06. If the first car leaves five minutes late, and the second leaves one minute early, both at 12:05, they are both “on time” according to the target. Riders waiting for a car might beg to differ. I think I get the impression that the schedulers and the drivers find it more important to follow the rules than to try for even flow and regular headway. More legalistic than results oriented. Perhaps they should be trusting their people on the ground more than their “plans” and “schedulings.” Or do I understand it backwards, and the troubles are more because they cannot rely on the people at the front. Steve: I think it is a combination of both factors. 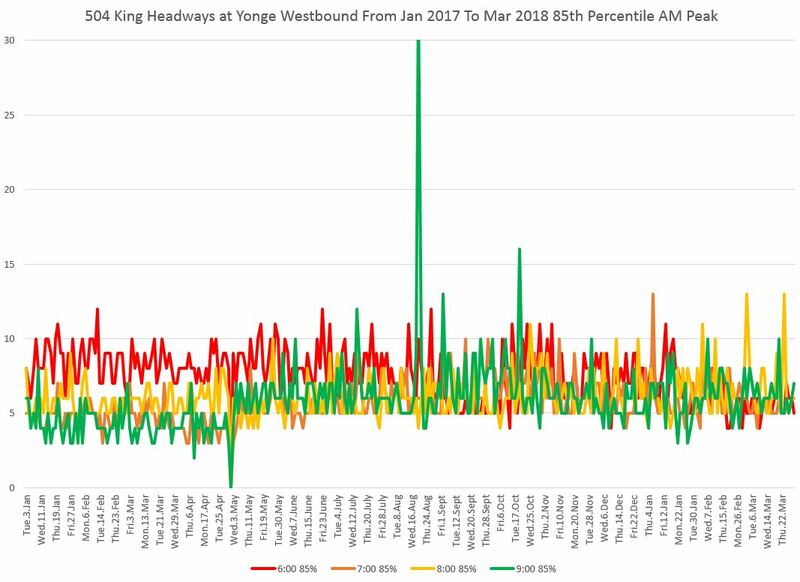 The TTC tends not to dispatch “by headway” partly because the tools to manage lines with a bird’s eye view have been less than ideal, and because the schedule has ruled supreme since the dawn of the TTC. There is also the consideration that running too much off schedule affects operator crews and there are big penalties when ops don’t get off work on time. These were included in the contract to counter ongoing abuses by TTC management in past years where work schedules could not be relied upon. That said, there are some operators who feel it is their duty to operate as close to the preceding vehicle as possible. These are fairly easy to spot in a detailed service analysis, and a good route supervisor would be able to spot this kind of “problem operator” from day-to-day experience. Doing something about it is quite another matter, and this requires a change in “TTC culture” where tailgating is considered a bad practice and management’s goal is to prevent it. This is complicated by “on time” metrics that allow a six minute window versus scheduled time, and in the process make pairs or even triplets of cars or buses fit within the “target”. This is a classic case of managing to the metric, although one might also argue that the “metric” was design to enable what the TTC was already doing. 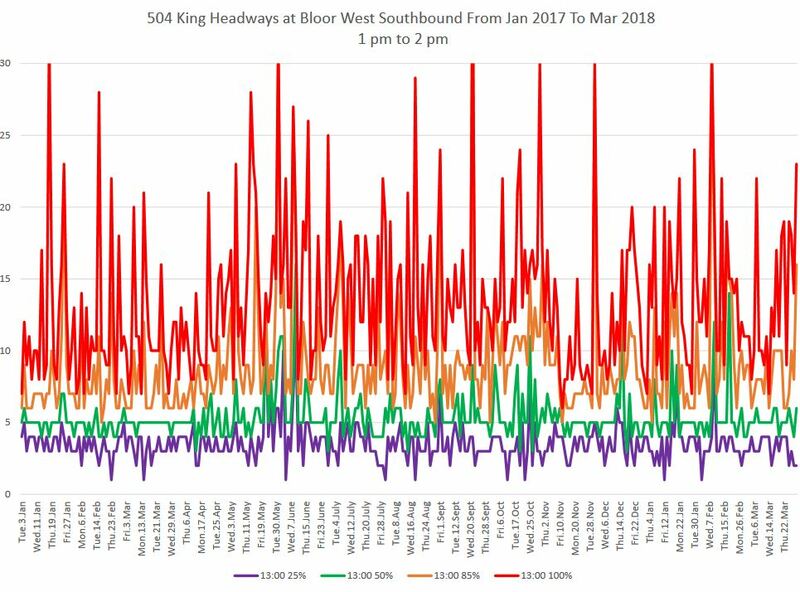 This fails both the riding public who complain about poor service, and the politicians and TTC board members who are told that everything is just fine because the targets have been met. I think you give too much credit to Doug, in this sense. Yes, it has been a clearly stated political position of his, however, your reaction suggests that he has a modicum of belief in what he said today, yesterday and last week, that is anything beyond the moment of utterance. Doug seems very much like his more likely to be a pure populist than his brother, seems more malleable and opportunistic that his brother – and I would doubt highly if his positions are based on much, other than his impression of the opinions of his audience, and a how it will stroke his own ego. Much as I have not been stunned as the current government has promised the moon, and not delivered, I would not be surprised at the inverse either where important tinkering is done quietly, or even bragged off, when it can be done in a way that garners votes and appeals to the base. Given the current polls, it is very likely that he will take ridings where the balance of electoral success that would favor doing things that, and where the marginal riding and marginal voter (ie the ones they do not have perforce, because there is nobody to the right of them) and to maintain position, they will fund and insist on these fixes, and demand that Toronto fix ttc management, and they will fund the most cost effective projects that they need to, to keep the most marginal seats, and brag about how they did more for less. I am not saying they will fund, I am merely saying, that I do not believe there will be any consistency to his positions other than they serve him politically and his ego – much like the current government. Steve: There have already been attempts through Michael Ford at Council to undermine the streetcar system, and I would not be surprised if this were to continue with assistance from Doug Ford at Queen’s Park. For its part, the TTC does a poor job of defending the streetcars. A report to the TTC Board is expected in June on the question of purchasing additional cars, and as you may know there was a request for information from the industry for alternative suppliers to Bombardier last fall. That is the likely context in which we will see how serious the TTC is about keeping and expanding the fleet. Yes but that seems to me, to be based on an in Toronto suburban target, where the marginal votes in the council seats are swayed with an anti-downtown message. At a provincial level really Toronto, tends to be viewed from a slightly greater distance, and the same types of games when you are premier – take on different tones and directions. That is petty politics, and egotistical games, and self aggrandizement, change their nature a little bit when you move up to provincial politics. If this man really had a position based on a considered thought, I would not question that he would sustain it. It is that I think it is not based on that, but the self – reinforcing knee jerk of the people who surround him, and what plays in city politics when played in only one borough at a time. Changes when you are not playing the same game, but Toronto becomes a single entity from the perspective of the entire province. I am saying it might change – in essence because he seems callow, and self serving, and more a reader of the room, than a leader. Steve: So far, there is every indication that Doug Ford will carry the same biases and self-serving attitudes to the provincial level. If anything, any excuse to deny downtown Toronto and the “elites” who want streetcars any funding is greater the further away from Toronto Council he moves. After all, this argument has already been raised in some of the “debates” about a Scarborough subway network. I can say from the distance of being nearly at the western edge of southern Ontario, that while I was a “downtown elite” here the locals do not really distinguish – it is all Toronto, and well, in effect the view that the Fords exploit in the outer 416, here is directed at all of the 416 and most of the 905. Steve: It is always amusing how the definition of “Toronto” is rather elastic depending on the viewpoint. 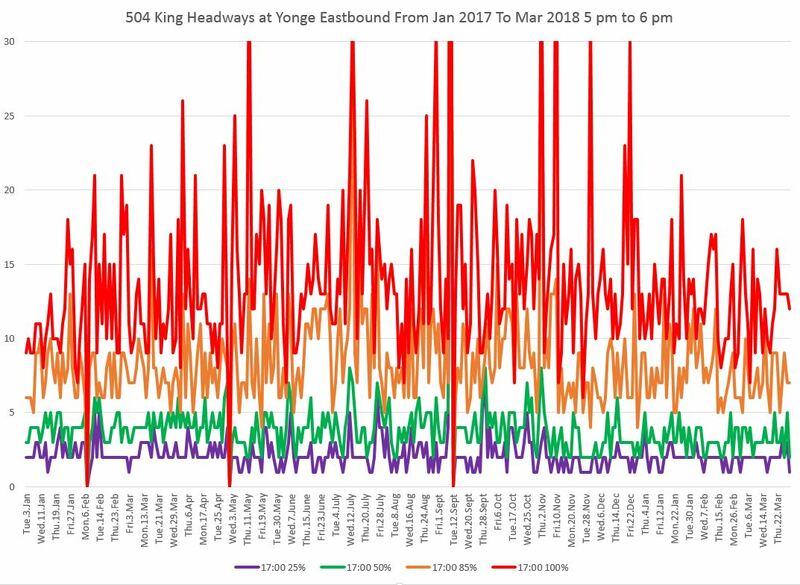 I’m actually starting to become curious about the large increase in ridership along King Street. It’s great, but it happened much more quickly than I thought would be possible. Where did the riders come from? Were they walking before? Driving? Simply travelling more often now that they have more time? Do they live along King street? Do they work along King street? Are they diverting from the Queen or Dundas streetcar lines? Were they people who in the past would go up to Bloor to take the subway? Or was it caused by a sudden change in people’s jobs and traffic flow that’s only possible because of this improved transit access? Steve: There are several factors at work. First off, the TTC doesn’t do counts very often, and it is possible that the “pre” count was already low. The main thing, however, will be latent demand. I see comments in social media and elsewhere from people who used to walk who now ride. 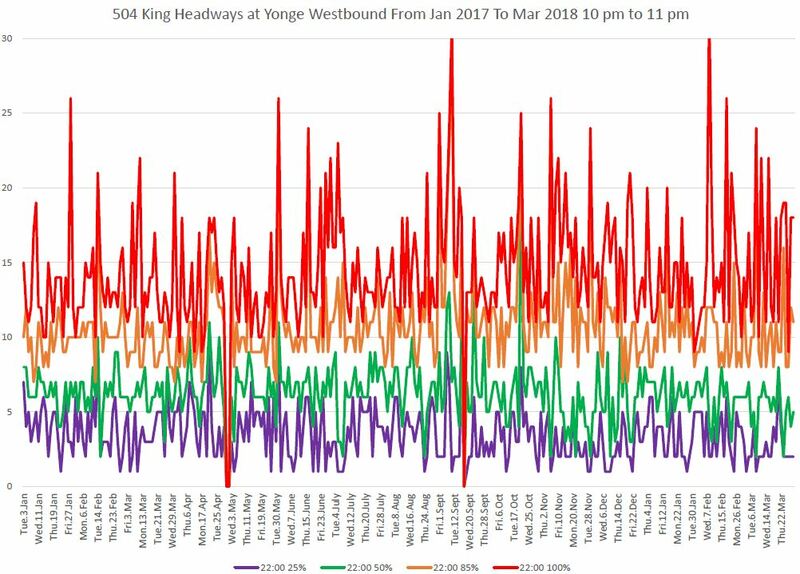 There might be some diversion from Queen, but Presto usage data on Queen showed the same pattern as other routes suggesting that it was not losing riders to the 504. 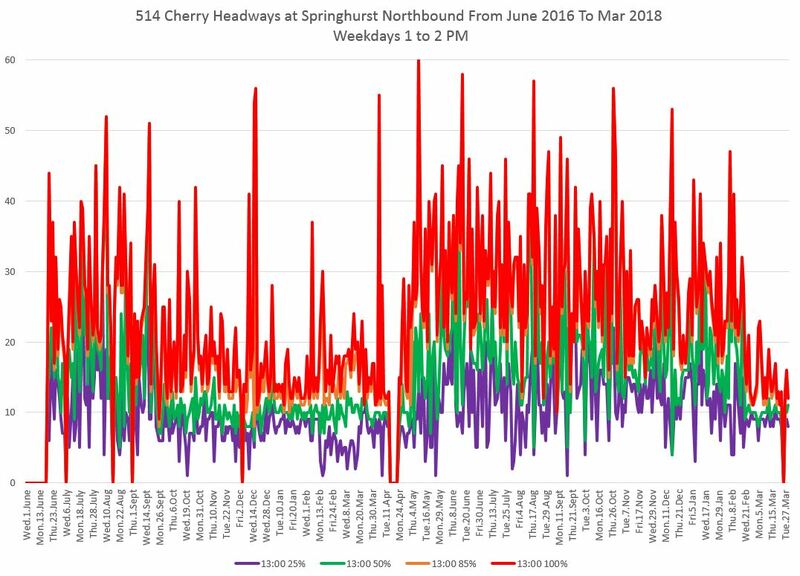 It’s amazing what can happen on a transit route when the capacity is increased. This is a fundamental problem in TTC service planning and budgeting. They don’t count riders they don’t see, and the focus on the budgetary side makes it look as if ridership is static when this could be the combined effect of evasion, Presto malfunctions and migration away from Metropasses which have a presumed high rides/month multiple. Also, of course, even if system-wide numbers are down, there will be individual places and times where ridership is up. But the marching orders from Tory and his cronies are to keep spending down, and that limits service growth. Coming from the east side I can point out two specific drivers of new demand. First is George Brown which opened a large student residence in Corktown on Cherry Street, listed for 500 occupants. Many of those 500 are making trips in and out to the campus on King Street at least four days per week, sometimes more than once per day. There is also the large new Globe and Mail office tower at King and Berkeley Street. At 17 floors it’s probably the largest ever office development downtown east of Church Street. George Brown also expanded its campus into the adjacent building which used to be the Toronto Sun newsroom. It’s amazing how the formerly sleepy Ontario Street stop now sees 20 people disembark every streetcar that arrives heading eastbound (!) from 8 through 9 am. Terminal departures are greatly affected by when an operator is able to leave; use of facilities, need to stretch, customer service etc. are big factors in terminal departures. A supervisor cannot force an operator to leave if washroom etc. is needed and it is more than likely that the following operator has to do the same so advancing is not usually possible. Communications is a key issue, as most operators do not call to advise of a delay and some areas have extremely poor radio communications; almost all end dwells are found out after the fact. Operators are not robots and crewing needs to change in order to allow for better service and also the human factor. Unfortunately there are operators that play games (as indicated by Steve in a comment thread), having supervisors across the property being mostly new due to mass retirements, an outdated CIS/GPS and supervisors monitoring on average 4 surface routes at the same time are large factors in end terminal departures as well as overall line management. Probably the best way to fix would be to enable VISION to run solely on headways with appropriate crewing; obviously VISION needs to be running but the collective agreement would have to be renegotiated for crewing allowance. As indicated by Steve the TTC does itself, the board and its customers a disservice by producing the current end terminal metrics. A lot of necessary steps need to occur to get it right, a light at the start point is not going to fix it. Hello Steve has there been any sign of material changes coming to the pilot soon such as the previously discussed stop platform issues? I have seen some signs of life on King Street but the crews look like they’re only engaging in superficial changes. Steve: Some work is underway for sidewalk extensions for patios, but I have not seen anything for the platform areas. I will ask the city about this.